At the heart of Kaladesh is the spirit of invention. It's an optimistic plane that embraces progress, that celebrates the new, and where anything is possible through hard work and ingenuity. 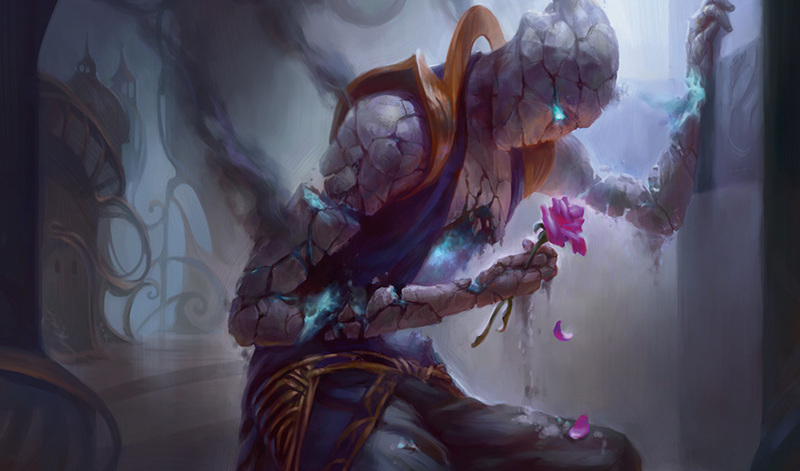 In fact, these are themes echoed in Magic's gameplay itself. You get to feel the thrill of invention every time you make or play a new deck or discover how two cards interact with each other. That thrill of invention is also something that Magic's worlds and story team (also known as the creative team) holds close to its heart, and it's one of the reasons that we're eager to take you on a tour through a cycle of the team's process of invention from a glimmer of an inspiration to a full-fledged plane. Here's the story of how Kaladesh came to be. But first, if you need to catch up on the story, download the full story in eBook form below. Big projects require teams of powerful minds. So, too, building any new world in Magic takes lots of different types of people and many steps along the way. 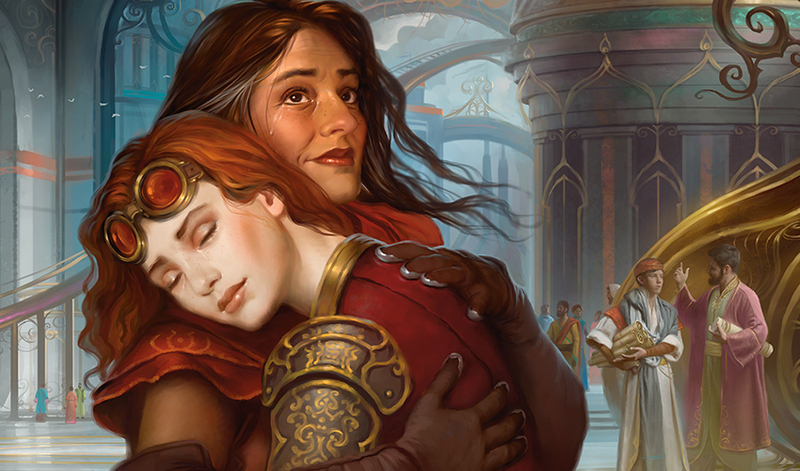 The making of Kaladesh drew on the talents of many individuals both from inside and outside of Wizards of the Coast. At the epicenter of this activity is Wizards' worlds and story team, which itself unites specialists in art and storytelling. Leading our team are principal designer of worlds and intellectual property (IP) Jeremy Jarvis and design managers Jenna Helland and Colin Kawakami. 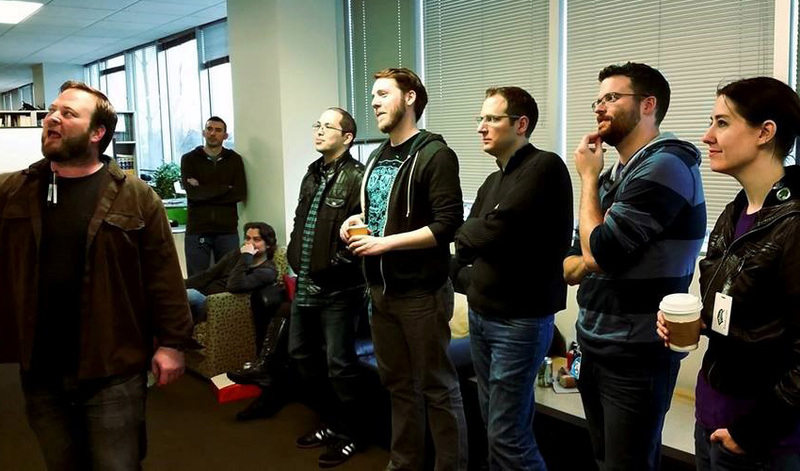 Next are the team's art specialists, which includes art directors Cynthia Sheppard, Mark Winters, Dawn Murin; lead concept artist Sam Burley; graphic designer Liz Leo; and concept artist Tyler Jacobson (pictured below from top left to bottom right). 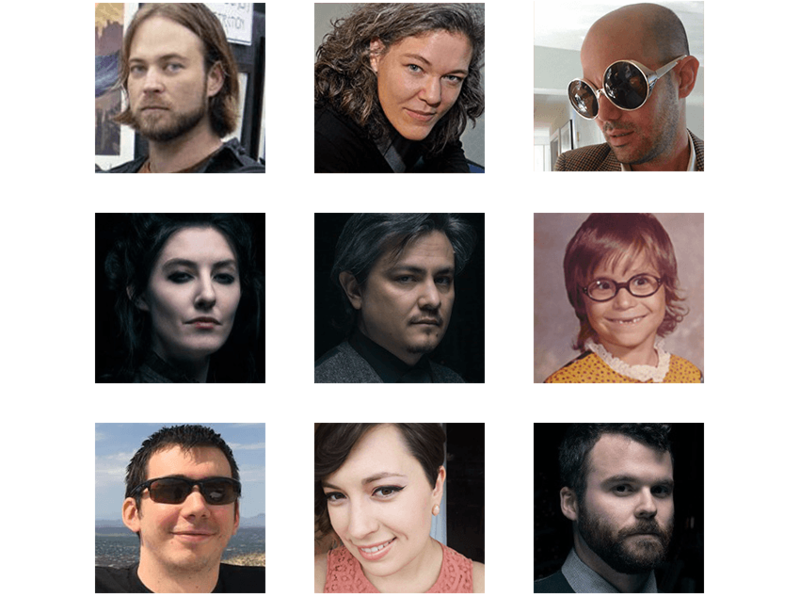 And finally, our story specialists Doug Beyer (Kaladesh's story lead), Kelly Digges, Matt Knicl, Kimberly Kreines, Ari Levitch, Mel Li, and James Wyatt (pictured from top left to bottom right). 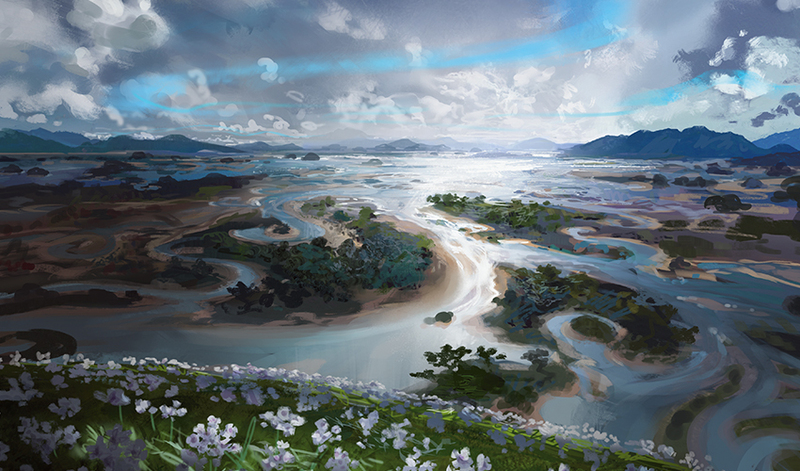 Together, the worlds and story team began the long process of worldbuilding back in 2012 when we were looking for what Chandra's home plane in Magic Origins might look like. 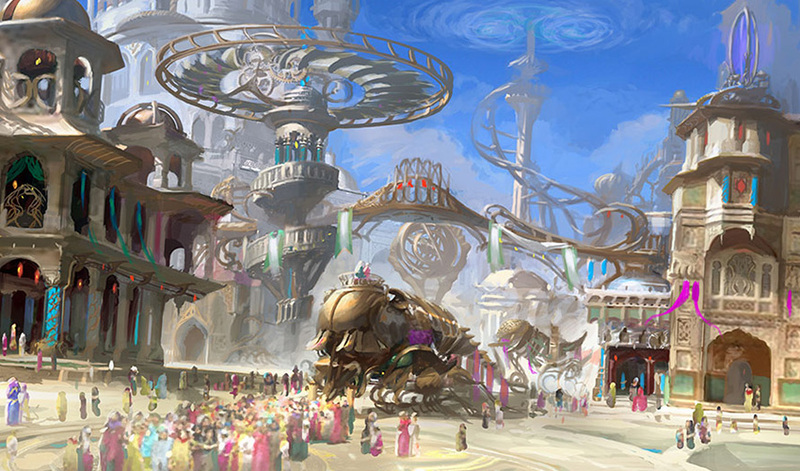 Over the course of the next few years, this collaboration produced the locations, inventions, and inhabitants of the plane of Kaladesh with the assistance of additional concept artists, writers, and consultants. There was a lot to do, but we had a plan for how to get there. With the team assembled, it was time to get to work. Generally, each of Magic's worlds begins years in advance of its actual release. It starts off with nothing more than a simple topline (for example, "Gothic horror meets cosmic horror"), which is then considered by the various teams in Magic R&D and placed in the right block within our greater story arcs and gameplay patterns. Next, we get together with the design team that works on the set's cards and mechanics in a phase called "exploratory design." This phase begins with a topline—the core concept of the world. Starting from that core concept, we explore connected tropes and ideas. The goal of this stage is to provide inspiration for the design team to do its own exploratory work, testing out rough concepts for how we might represent the rules mechanics that design was proposing for cards in the block. 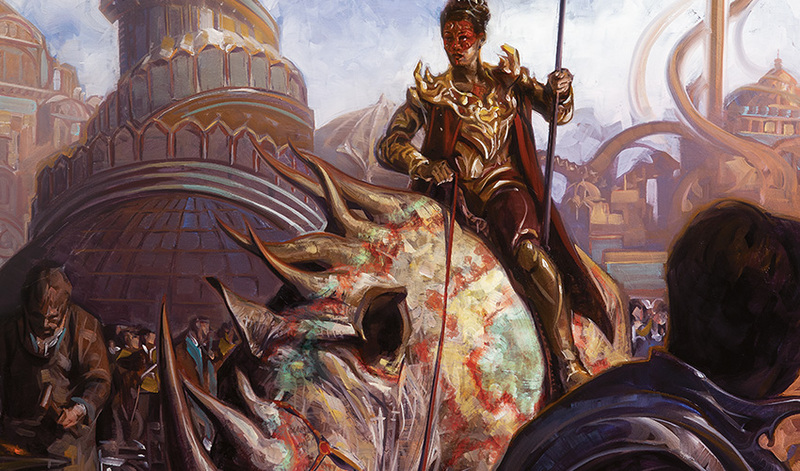 For Kaladesh, our starting topline was "optimistic steampunk." At this point we knew that design wanted to express a theme of invention through artifacts, and the main mechanic that they handed to us was energy. One of the first inspirations that struck us was the idea of using the bright, brilliant colors and cultural inspiration of India. We loved the color pallet that fell out of that, the beauty of that world, and the opportunity that it presented for us to explore a place that Magic hadn't been yet. Next we considered the "steampunk" theme. Steampunk is often about new and creative inventions and people thrilled to be pushing boundaries. Similarly, we wanted the people of our world to be genius inventors who would look with hope to the future. One of the first things we did was some visual explorations into the look of the gear. We wanted to reinvent it as something unique and specific to this new world. 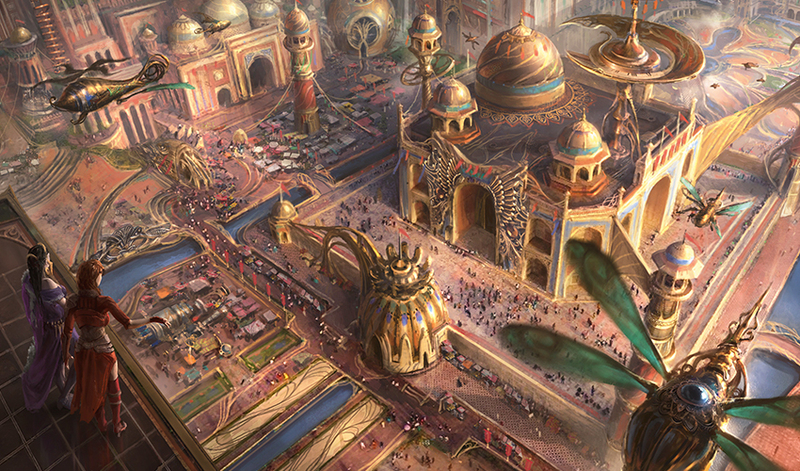 Our concept artists started with inspiration from jewelry and found that there was a space we could play in there, to make this aesthetically our own, belonging to this new India-inspired Kaladesh that we were creating. We loved the careful, beautiful craftsmanship that we were seeing and how it cares about the most intricate pieces and designs. These would be artifacts made completely by the inventors here, not integrated with organic material like on Mirrodin. 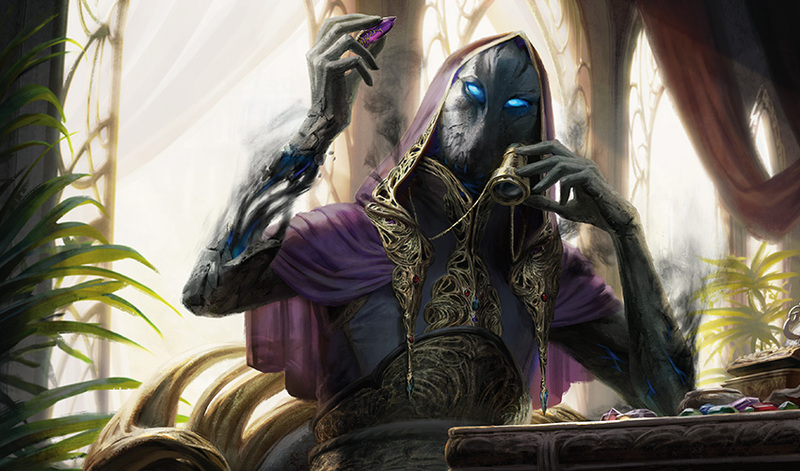 Instead, on Kaladesh artifacts like thopters, automatons, and constructs would be incorporated as parts of the inhabitants' daily lives ("technology, not biology"). But the steampunk genre has implications of soot and grime, and we didn't want a gray, gloomy world that evoked the look of the Industrial Revolution or of the Innistrad block that would precede Kaladesh. Instead we were looking for inventions that were works of art and energy that was clean and tied into the world itself. We needed to find a form of energy that could allow the world to remain clean and bright. That was when we decided on aether. Aether is the same material that occurs as the magical energy that inhabits the space between planes. 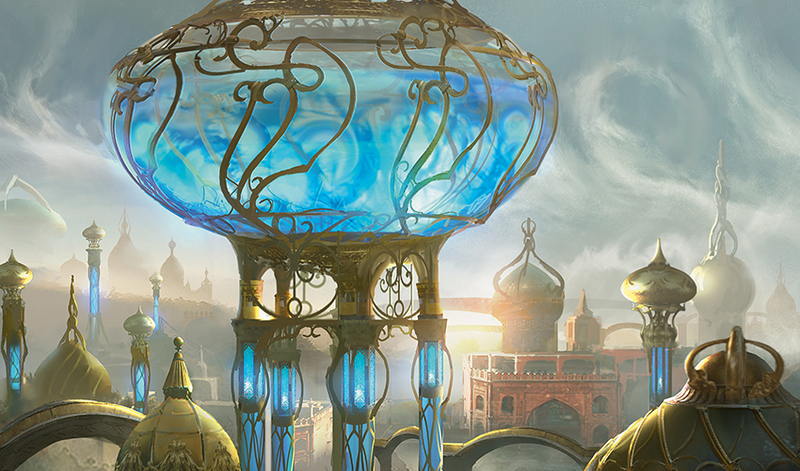 Here on Kaladesh, though, it's concentrated and abundant throughout the planes' environments. Unlike the coal and soot of the Industrial Revolution, aether is a life-giving resource that infuses the natural world, from the trees that bend to be near it to the mountains and creatures who echo its swirling patterns. After exploratory design, our next step is to flesh out the exploratory concepts from the bare bones of what would eventually become the world and story guide that advises our artists and external writers. 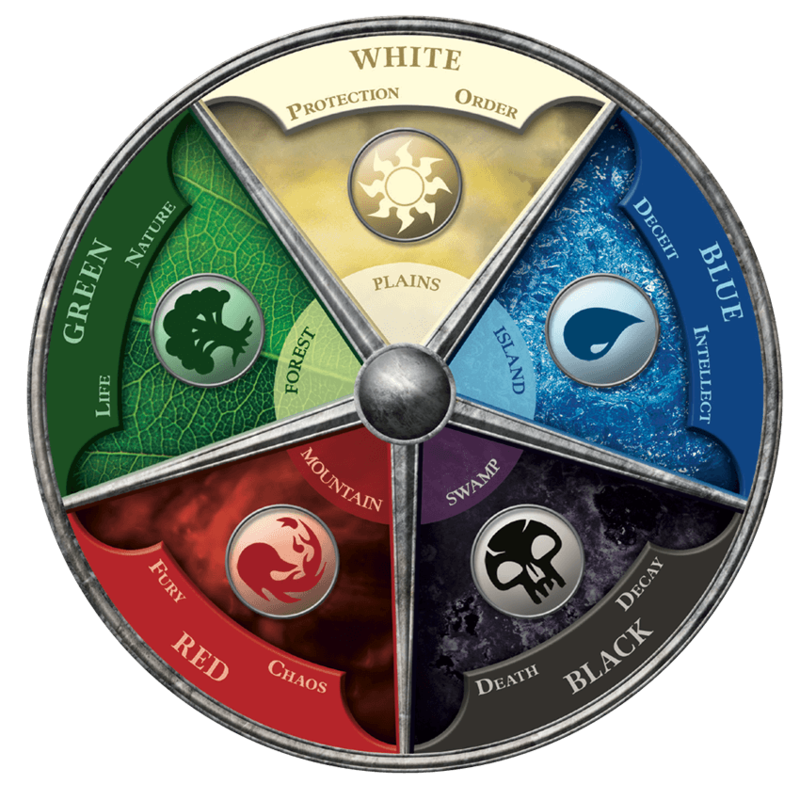 This is the part of the process in which we determine the themes, creature types/races, and/or factions that would exist in each world. 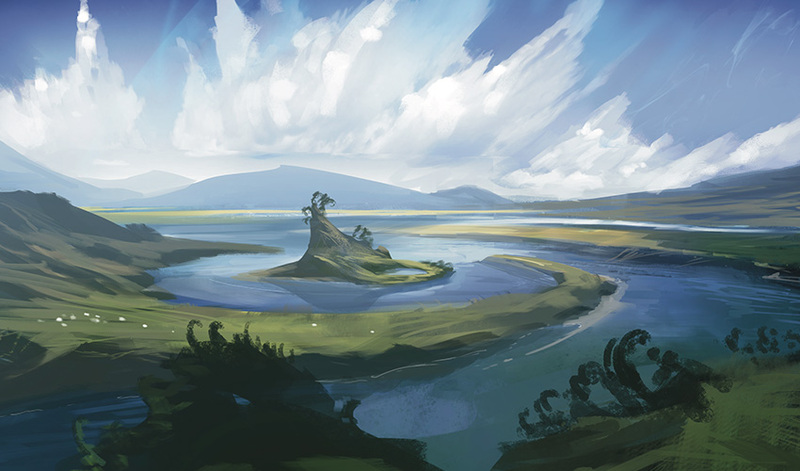 Our main goal from this step is to decide what creatures would be here, what sort of locations we would see here, and ideas for the history and use of aether itself. Although we don't have many visuals at this point, prewriting provides suggestions for what we might and might not see so that we can give clear guidance to the concept artists who will come aboard at the next step (the "concept push"). Elves (centered in green) who inspire are connected to the world around them and deeply in tune with aether and how it affects the natural world. Vedalken (centered in blue) who innovate are associated with deep theoretical work. They are meticulous and detail-oriented and delight in iteration and improvement. 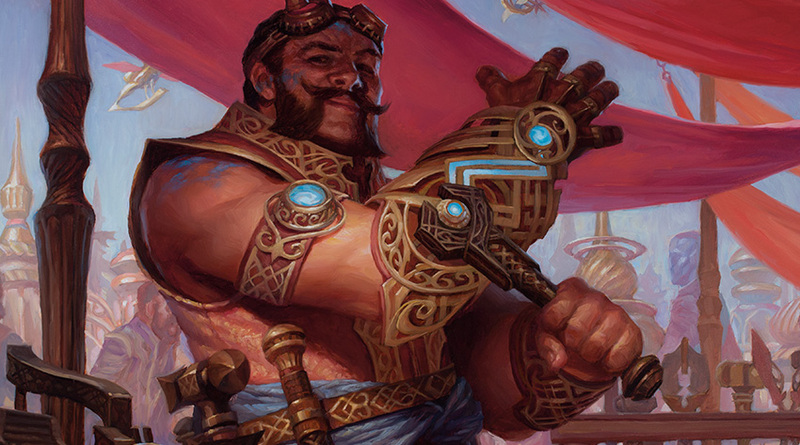 Dwarves (centered in white) who build are the hands and muscle of Kaladesh. We were waiting for some time to bring back dwarves in an exciting way that was different from the previous mountain-dwelling red creatures we had seen. They carry their tools with them and always have the right tool for the job. Gremlins (centered in red) who liberate are raccoon-sized creatures with an unquenchable thirst for aether. These creatures are more than happy to fulfill the role of taking energy from the inventions used to harness it, though other Kaladeshi aren't always happy to accommodate them. Aetherborn (centered in black) who reclaim are a brand-new elemental race that come into being as a spontaneous byproduct of the aether refinement process. 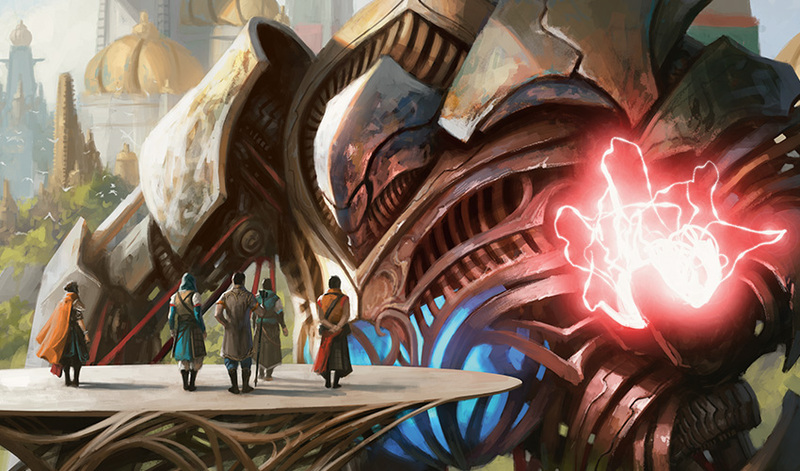 Since the aether refinement process is one directly related to the city of Kaladesh, aetherborn are quintessential urbanites who thrive on the pleasures of city life, savoring every moment of their brief lives. When pre-writing is done, the art directors bring concept artists to translate those ideas into the visual look of the plane. Over the course of a few weeks, these concept artists generate and refine hundreds of images, exploring the look and feel of every aspect of the world. Art review during the concept push. 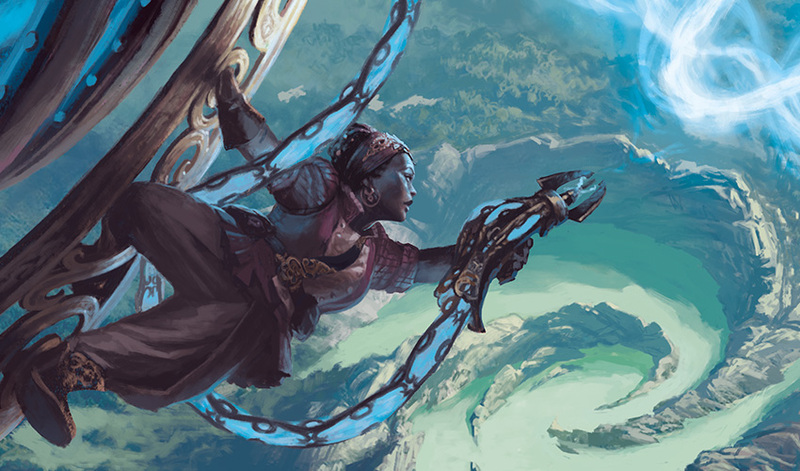 Kaladesh brought together an all-star team of concept artists, including Sam Burley, Steven Belledin, Chris Rahn, Cynthia Sheppard, Daarken, Tyler Jacobson, and Kieran Yanner. Their work produced our first images of creatures, devices, costuming, weapons, and architecture that created a unifying look and feel for the plane. After a few more rounds of discussion and refinement, these would be the visuals used in the next step's world guide. Since we were using inspirations from a living culture, we decided to take a different approach than we did with civilizations inspired by mythos of the distant past, such as Theros. Additionally, the design team's artifact-centric theme took us to a more futuristic steampunk sort of feel than one that was focused on inspirations from the past. 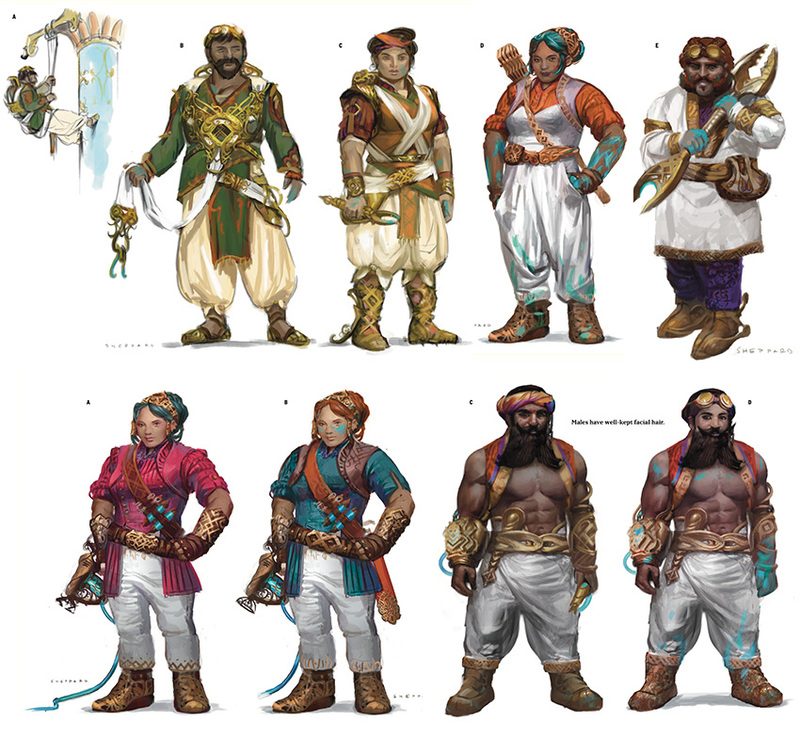 Alongside these real-world references, we wanted to bring in fantasy by showing aspects of Indian people, clothing, shape language, and color palettes in a new setting that expressed the energy and artifacts from the design team's vision of the set mechanics. We saw it as an opportunity for players to see themselves in our game and for us to transport them to a fresh and exciting new look at a fantasy world. With the pre-writing and the visuals from the concept push, the team now has enough material to begin a deep dive into creating the details of the world—from its culture and characters to the locations and landmarks. For Kaladesh, this is when the city of Ghirapur acquired its neighborhoods (the vibrant Greenwheel, the port region of Bomat, the artistic Weldfast) and characters (daring pilot Depala, wily Gonti, the ingenious aether scientist Rashmi, and luminary engineer Saheeli). All of this material is edited and compiled into a single document that contains art and text that fits together and reinforces each other: the world guide. You'll be able to see some of the pieces from the world guide featured in this article and many more in our upcoming The Art of Magic: The Gathering—Kaladesh publication. The finished world guide goes to every artist, writer, designer, and developer who works on cards in the block to provide them with art and story references for commissioned pieces. In addition to producing the world guide, this is also the stage when the team decides on the main milestones of the block's story. You might have noticed that this set features "Story Spotlights" that represent some of the most important events in the set and are featured both on single cards and in Magic Duels' single-player campaign. 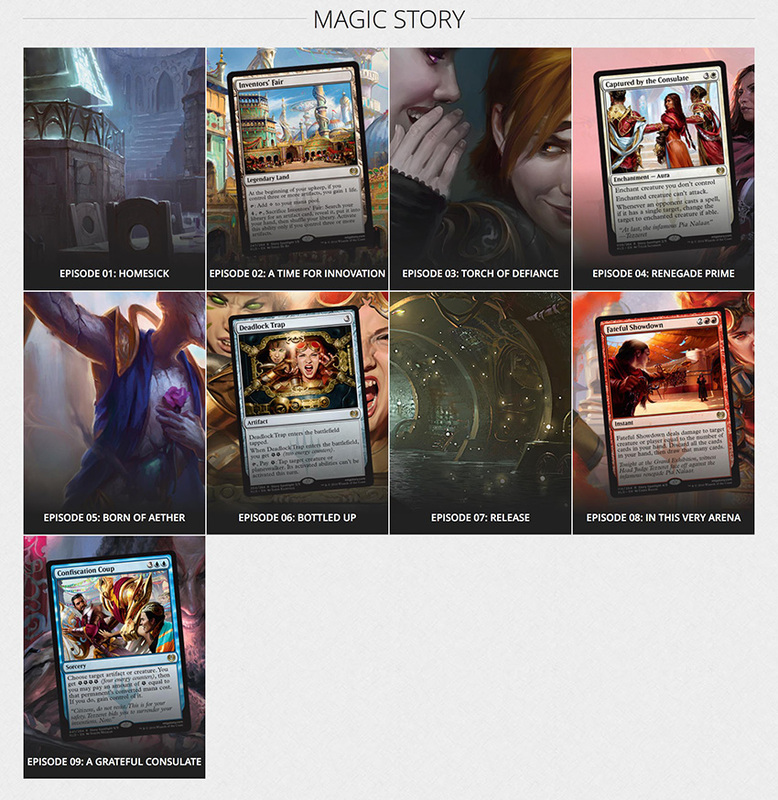 You can see all of our current Story Spotlights and the stories that we've written to go along with them on the Kaladesh story page. One (of five) of Kaladesh's new Story Spotlight cards, indicated by the Planeswalker symbol watermark. While the world guide is under construction, design is finishing their work on the set and development is well under way determining the rules text that will appear on the cards. At this point, the worlds and story team decides what should appear in the art boxes to best represent the world in the cards; we write up card concepts to convey these ideas to the artists. Batches of these card concepts are commissioned to the individual artists (many of whom work outside of Wizards) whose names you can see in the artist credit on the bottom left of each card. With each concept, we include the world guide to inspire the artists and to help coordinate their efforts with other artists. Once these concepts have been commissioned, each piece is reviewed by the worlds and story team from sketch to final to make sure that it fits with other pieces and with the card's mechanics. Let's check out an example! Here's the card concept that was written for Steve Belledin's Demolish piece. 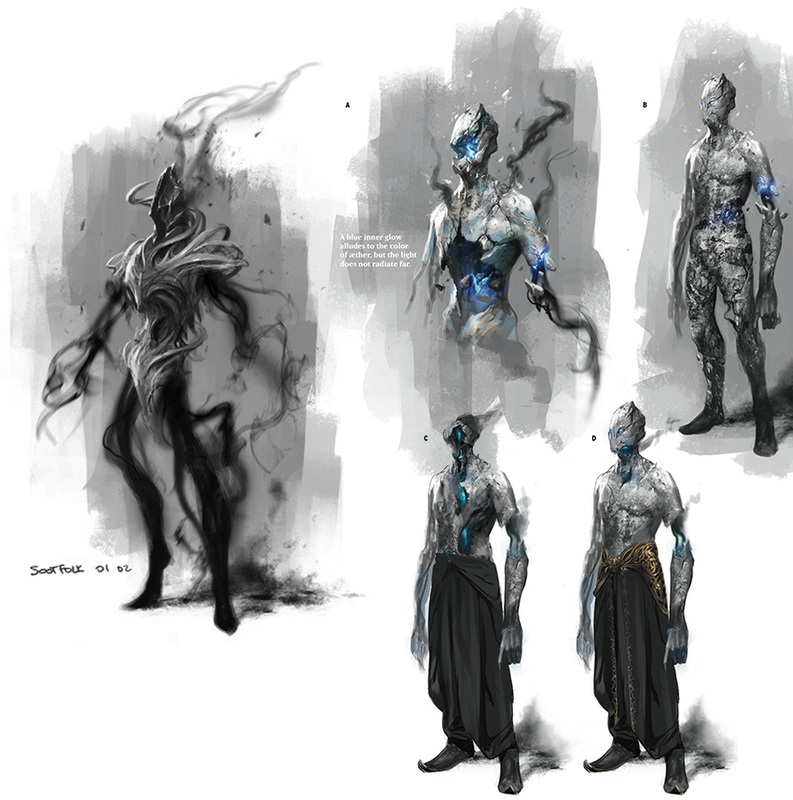 You can see the references to concept art in the world guide indicated by the page numbers, which we've included below along with Steve's final art in the images below. Action: Show a gremlin (pp. 71–73) that has wrecked an intricate, once-beautiful thopter (p. 88). 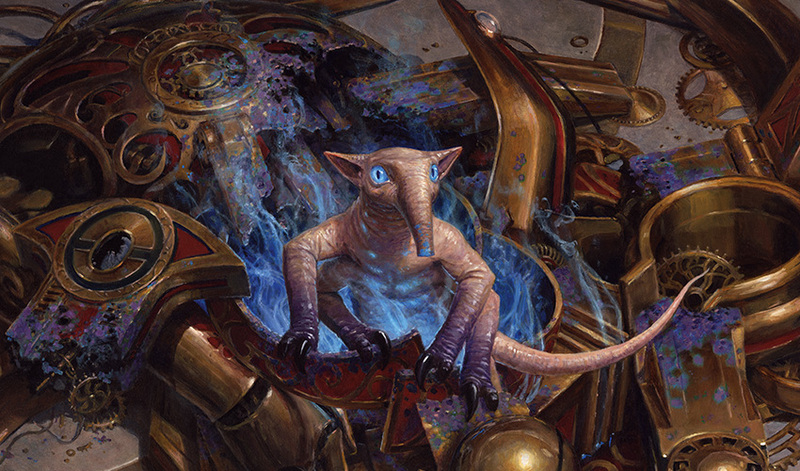 The gremlin's claws have torn through the thopter chassis, and its snout and belly have a blue tint from gorging on the aether within. Maybe it looks up at us like, "Oh, did you want a bite?" 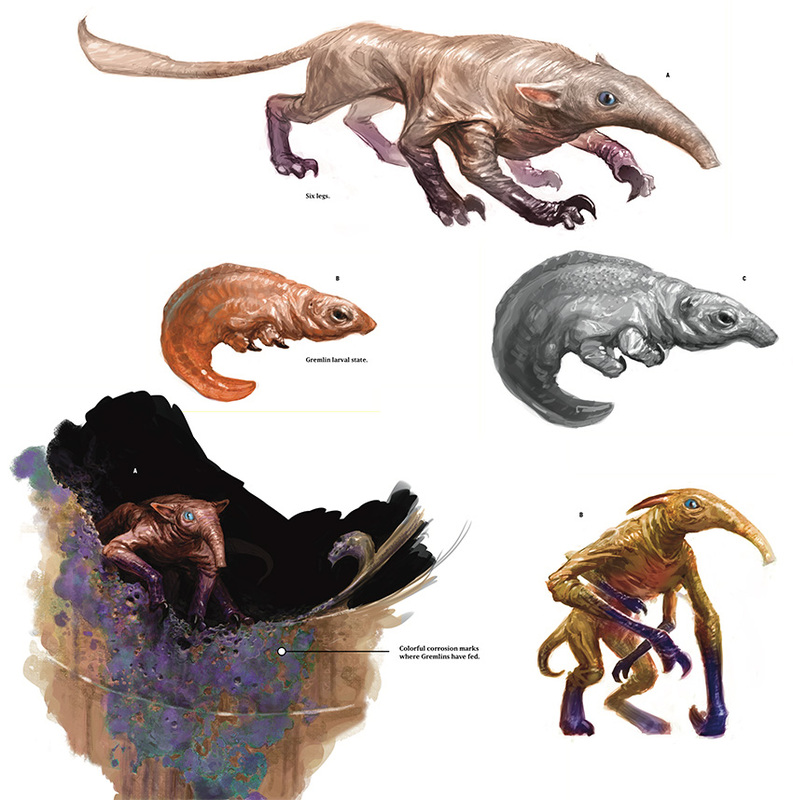 Here's a look at some of the other creatures of Kaladesh from their concept art to their final card art. While the concepts are being commissioned to artists, we also begin working with another team of writers to help us produce the flavor text and names that appears on cards. Finally, the commissioning phase was also around when we needed to add certain unique graphical elements to the set. 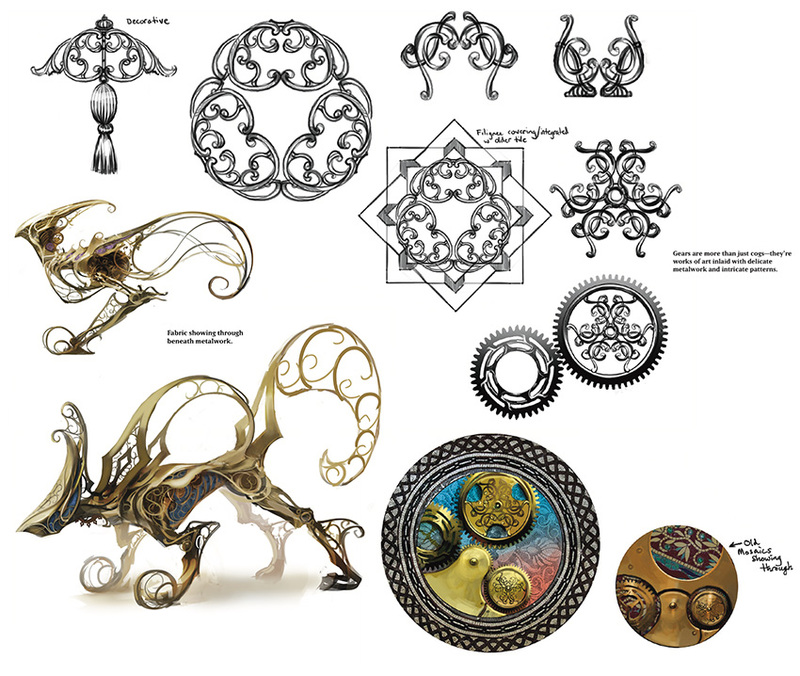 We wanted these graphics to help players identify some of Kaladesh's new mechanics, including iconography for energy, the set expansion symbol, special card frames for the set's Masterpiece Inventions and Vehicles, and designs for our new Story Spotlight cards. These aspects were all handled by Wizards' graphic designer Liz Leo, and went a long way toward providing a visual language for our cards. Just as the world guide is used to provide a cohesive sense of Kaladesh's visuals, we produce an episode guide for Magic Story. This begins back when the world guide is being written and the main beats of the story mapped out, and it is finally finished near the time that the card set is finalized—though still months before the first story needs to be written and submitted. It's a time when we can check over character development, plot pacing, and coordination with events like PAX and the set's Prerelease. In its final form, the episode guide plans stories week by week for Magic's fiction writers—a group comprising the worlds and story team's writing specialists alongside wordsmiths Nik Davidson, Chris L'Etoile, Alison Luhrs, Ken Troop, and Michael Yichao. Throughout the block, different writers will take on stories from the episode guide while other team members review their work and coordinate continuity between stories that will be written until just weeks before the end of the block. Each of Kaladesh's weekly Magic Story entries has its start in our block-spanning episode guide for stories. Phew. 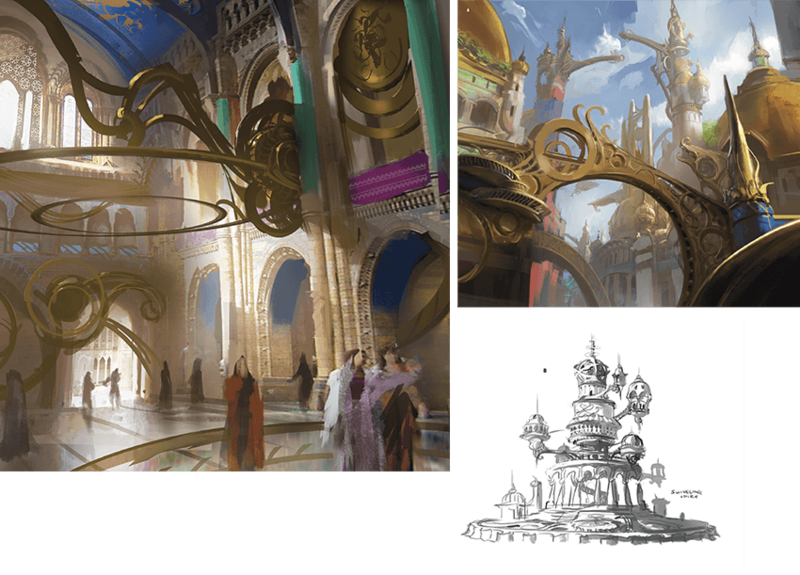 So there you have it—the multi-year process of creating the plane of Kaladesh from a conversation between the worlds and story team and the design team to the images and text that appear on the cards in your hands. 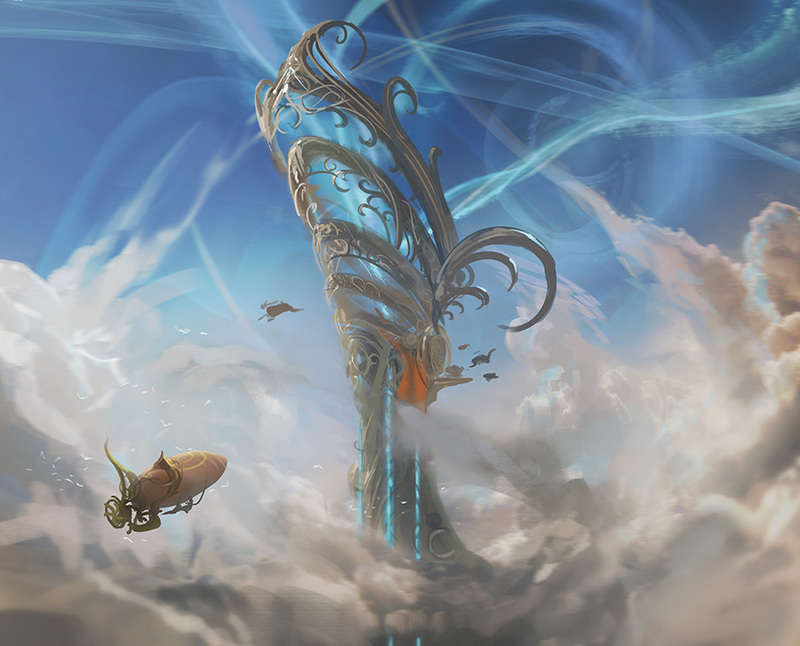 It's been a labor of love between a host of writers, artists, game designers, and other aether-infused inventor brains both inside and outside of Wizards, and we're happy to share some of the blueprints that led to its creation.